A cup competition sponsored by the BPA Supporters Club is more likely to have been a local amateur soccer comp. Then again, I'm guessing as I've honestly never heard of it. You might try dropping an email to the Telegraph and Argus. There ought to be some record of it in their archives. Leadsom really has excrement for brains. Sadly, in that cabinet, she's by no means alone. An actuary is an accountant who had to give up accountancy because he couldn't cope with all the excitement. I was told this by an actuary. So the captain of the brexiteers is Kevin Sinfield? Bradford won their first twenty SL games in 1997, clinching the title before losing the last two. Not sure if anybody has got nearer than that to an unbeaten league season. 'Wings - the band the Beatles could have been.' Sheer genius from Alan Partridge. 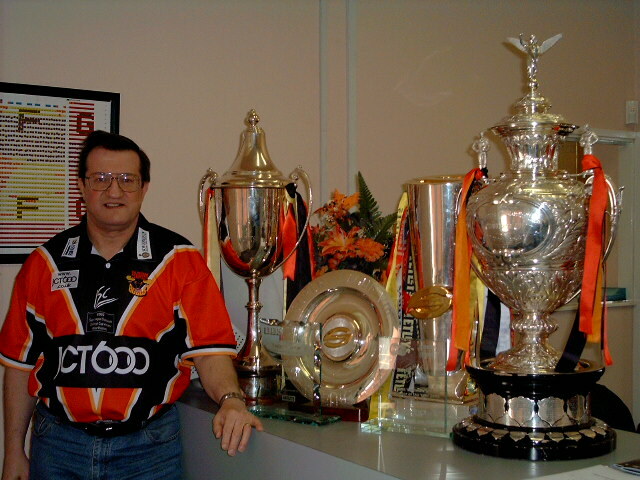 Not to mention VRs David Campbell (1999) and Gerry Kershaw (2002) robbing Bradford of two Super League titles. Wonder how many times that's happened to Fev. I think Pointless is a useful indicator of general public knowledge of/interest in the subject. It may be discouraging to learn that only four of GB's 2017 World Cup squad were known to the 100 people polled, but Union fares little better. A year or two ago a similar question about the 2003 England World Cup winning team showed that only three members scored points, Jonny Wilkinson, Martin Johnson and Jason Robinson. All other squad members were pointless. May I refer you to Padge's earlier post. Actually I was in the ground today. Looks fine to me, no idea what everybody's moaning about. Contradiction in terms. RFL and 'plan'. My mum and dad were also there. They wouldn't take me as I was only 4. Spoilsports.